The Infinix Hot 5 Lite was launched alongside its elder sibling Infinix Hot 5 x559. 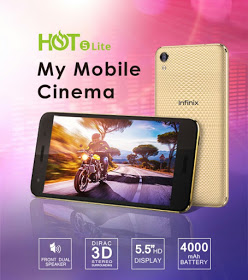 The Infinix Hot 5 Lite is the lower version of the Infinix Hot 5 x559. They both shared almost the same specifications and features, but the difference between both devices are, Hot 5 has fingerprint sensor and 2GB RAM while the Hot 5 Lite has no fingerprint sensor and has just 1GB of RAM. If you need a budget phone to go for, then the Hot 5 Lite is not a bad choice. 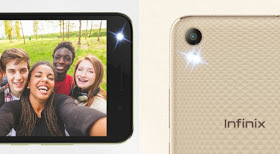 Infinix Hot 5 Lite looks similar to Hot 4 Lite. The difference between the two devices are; Infinix Hot 4 Lite comes running on Marshmallow while the Hot 5 Lite comes running on Nougat and both doesn't have fingerprint sensor. Hopefully, Infinix Hot 4 Lite might receive Nougat soon. Wow.. Infinix means business.. Just d ram... The xtheme feature has been removed in the nougat update. 😔..
Infinix needs to work on the RAM, well nice phone with good specifications. In the year 2017,for 50k, this is disappointing. This is Itel level phone...poor everything.. I mean 2gb ram!Processor same as last years models. Picture quality actually going backwards... Infinix try and step up your game o.. Otherbrands will brush you aside soon.. In the year 2017,for 50k, this is disappointing. This is Itel level phone...poor everything.. I mean 2gb ram!Processor same as last years models. Picture quality actually going backwards... Infinix try and step up your game o.. Other brands will brush you aside soon..
1gb of RAM is too small, well it is still manageable with the amount on it.